Maximize your performance by reducing welding smoke at the source using the AIRGOMIG MIG fume extraction gun. With an equivalent vacuum source, the AIRGOMIG MIG gun offers 5 TO 25% higher air flow than competing products, thus creating improved fume extraction efficiency. A study carried out by Le groupe Gesfor Poirier, Pinchin Inc., which is a specialized sampling company, demonstrates that the AIRGOMIG fume extractor manages to keep concentrations of manganese in the welder’s breathing zone below the 0.02 mg/m3 threshold. From design to manufacturing, Airgomig MIG Fume extractor guns are developed on the Canadian soil. The ball joint, reduced weight : 5 to 25% lighter compared to similar products on the market and the ergonomic design of the handle offer improved mobility and reduce the welder’s effort by adapting to all working positions. The flexible simplicity that adapts perfectly to any working position. A timeless design and versatility that make it the perfect ally of the welder. Subtle and elegant lines of curvature that offer the user optimal flexibility. WHICH AIRGOMIG IS MADE FOR YOU ? The American Conference of Governmental Industrial Hygienists (ACGIH) recommends maintaining a maximum manganese concentration of 0.02 mg/m3 in the welder’s breathing zone. 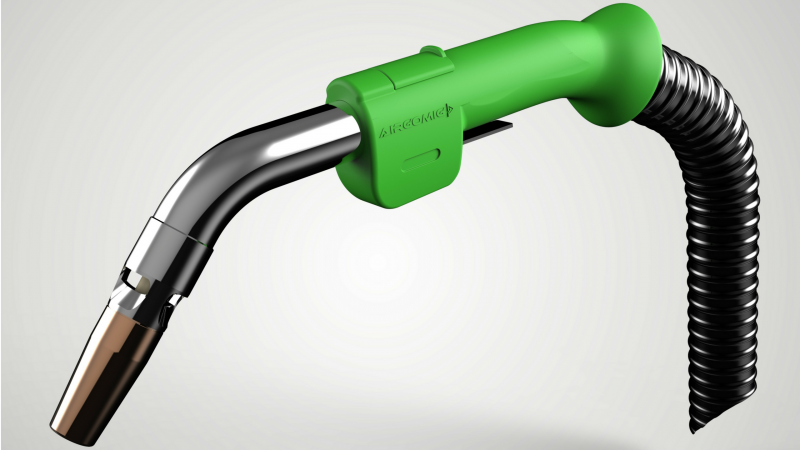 Tests carried out using strict welding parameters have demonstrated that the AIRGOMIG MIG gun can meet exacting demands.